Charlie Frank, managing partner of Zingerman’s Candy Manufactory, has been making some version of this for his wife, Katie, for years. She loves peanut butter and chocolate, so Charlie has been perfecting this combination for a long time. Now, we all have the good luck to be able to enjoy the results of all of Charlie’s work! The bar starts with creamy peanut butter, a bit of milk chocolate, and crisped rice. The “secret” star is our super flavorful peanut brittle bits! Their crispy/crunchy/crumbly texture and deep peanut and caramel flavor are the backbone of the bar, and where we get the “Crush” part of “Peanut Butter Crush.” Just the right touch of sea salt and a bath in fantastic dark chocolate round off the flavors! The Crush is an example of what Charlie is so good at—taking classic flavors and updating them into a less sweet, more complex and flavorful candy-eating experience. Available at all Zingerman’s Delicatessen, Bakehouse, Creamery, Coffee Company, Roadhouse, Mail Order and select retailers around the nation in mini 6-packs and full sized bars. Take a bite and you’ll be transported back 100 years. Zzang! 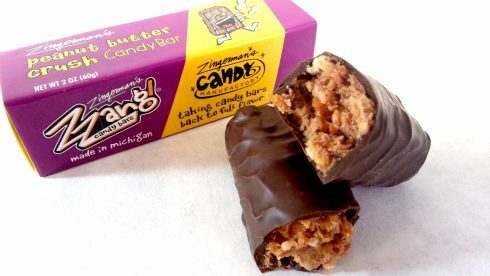 To order candy online, check out Zingerman’s Mail Order. To find it in your local store, see where our candy is sold around the country.